We all know that Samsung is the World leader in Smartphone manufacturing and is always trying to add something new to its mobile. Quick connect is one of those features that Samsung introduced with Samsung Galaxy Grand. Samsung Galaxy S6 quick connect is new feature added by Samsung that allows you to share contents and files through another device. Quick connect is a built in utility which can ease up your data sharing. But many of us just ignore this feature because we have no idea of how to use it. 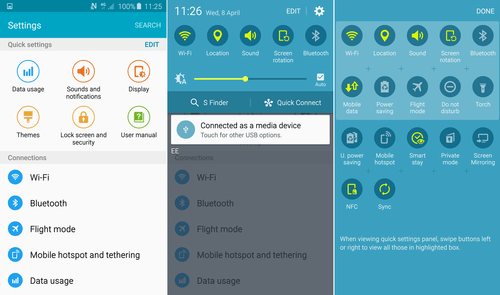 Samsung Galaxy S6 quick connect allows you to search for devices and connect to them via Bluetooth of WI-Fi .It eases up the lengthy process of authentication and other settings. Samsung Galaxy S6 quick connect is mainly located in notification panel. Just swipe it down and you will find it there. If it is not present, then just click edit in notification shade and move it. Samsung Galaxy S6 quick connect can be used with any device containing Bluetooth or a Wi-FI . Your device does not need to be from Samsung. This means you can share the data using any device irrespective of its manufacturer. To use Samsung Galaxy S6 quick connect, just open it and it will start searching for any external devices around it. Your Bluetooth and Wi-Fi will be automatically activated. Now tap the device found to connect it. This will enable the sharing feature. Tap on Share Content to select the files to be shared and click OK.
By following these steps, you can easily share your data through quick connect feature. For any further questions or queries feel free to comment below. Also read our other articles about Top 10 Smartphone available and some useful Computer Hacking tricks. We hope you like our article. Do like our facebook page and subscribe to our newsletter.